A Wop-Bama-Lu-Mop! A Wop Bam Boom! Shout that from the roof tops in celebration of one of the best productions to come out of the YMCA. Other shows at the St Thomas Street theatre have been good – but this is outstanding. It rocks, rolls and bounces with energy as the cast spread the word about the high school rocky romance between bad boy Danny and Sandy, the girl from the right side of the tracks. YM Productions put on Grease in 2013 and it was more than okay – but this is, under the direction of James Aconley, brimful of confidence and sassiness. The whole cast master the American accent, they sing, act and jive their way through the hit-filled 1950s’ music inspired score – Grease Lightning, Grease is the Word, Summer Nights, We Go Together, Shakin at the High School Hop and Born to Hand Jive. Leads Sam McCann as Danny and Amy-Kay Pell as Sandy are both strong in their roles – and play up the opposites attract aspect of the story to perfection. They both, too, can sing with Pell melting hearts with Hopelessly Devoted to You and then both revving up the pace with You’re the One That I Want. There is great support from Chelsea Cooke as Rizzo – the archetypal rebel teenager on the verge of womanhood. She delivers There are Worse Things I Can Do with the right mix of venom, angst, sadness and wistfulness – and performs Look at Me I’m Sandra Dee in the mocking tone it demands. 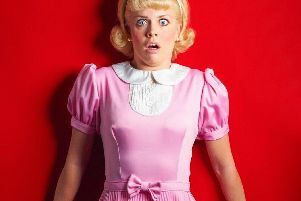 There are lovely cameos from Rebecca Boag as Jan, Liv Dolan as Frenchy and Kerry-Jean Wright as Marty. They get their chance in the limelight with Freddy My Love and Beauty School Dropout – which is Teen Angel by any other name. The choice of production was inspired as the film version of Grease celebrates its 40th anniversary this year and there are special screenings and the music is played time and time again on radio stations across the country. But you cannot beat live theatre – and this is electrifying so go, go, go, go, go, go, go, go, go, go ... like grease lightning to see it. Grease runs at the YMCA Theatre, St Thomas Street, Scarborough, every Tuesday, Wednesday and Thursday until August 30, at 7.30pm.